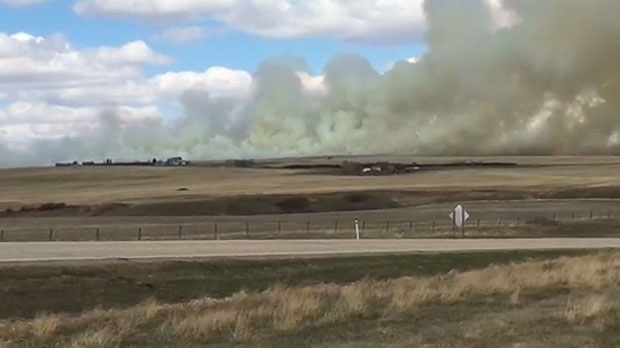 An afternoon grass fire west of Drumheller prompted officials to close two highways after the blaze jumped Highway 575. 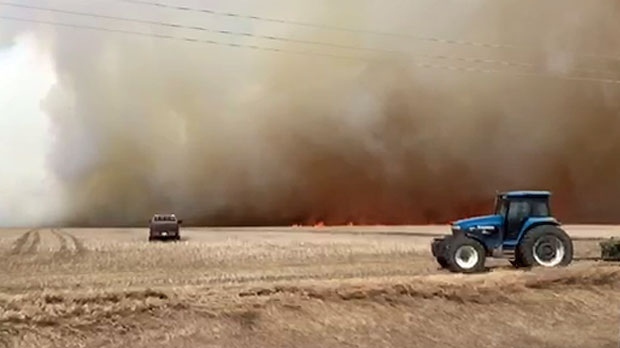 Debra Grosfield with Kneehill County says fire crews from the county as well as crews from Carbon, Linden and Acme responded to a rural area near the intersection of Highway 21 and Highway 575 shortly before 3:00 p.m. following reports of fire. Peace officers blocked sections of both highways after smoke reduced visibility in the area and flames threatened the road. Randy Procyshen was leaving Drumheller when he encountered the grassfire. Procyshen says firefighters struggled to get a jump on the fire as a strong wind from the north caused the blaze to spread and several structures were in the path of the fire. According to Grosfield, the fire was considered to be under control by 4:00 p.m. and there are no reports indicating the fire damaged any structures. An afternoon grassfire west of Drumheller prompted officials to close two highways after the blaze jumped Highway 575.